Heartbreaking and darkly comic, these are the moments that litter the messy road from cared-for to carer, a journey that Robyn Hollingworth finds herself on when she's only twenty-five years old. Leaving London to return home to rural South Wales, Robyn finds that it's her old life - same teddy bears resting on her pillow, their bodies tucked under the duvet; same view of the garages behind which she'd had her first cigarette and first kiss - but so much has changed. Her dad, the proud, charmingly intelligent, self-made man who made people laugh, is in the grip of early onset Alzheimer's. His brilliant mind, which saw him building power stations and literally bringing light into the lives of others, has succumbed to darkness. As Robyn settles back in the rhythms of life in the rain-soaked vast Welsh valleys, she keeps a diary charting her journey as the dad she knew disappears before her eyes. 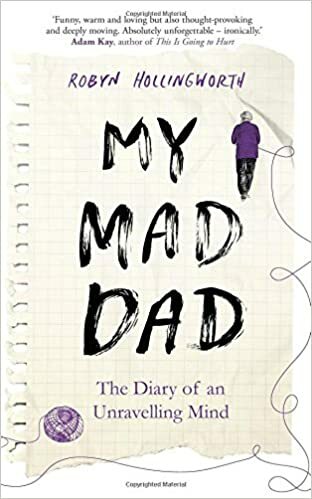 Lyrical, poignant and with flashes of brilliant humour, My Mad Dad explores how in helping others we can heal ourselves. My Mad Dad starts with an introduction to the author, Robyn Hollingworth, and her family. It comes over as affectionate, humorous and very human. Here is a 25 year old who loves her father and moves from London to “small town” Wales to help her mother look after him. This book is about coming to terms with both the move and his Alzheimers and the changes that life imposes on her. It feels as though, while the writing makes reading easy, the content will not be. Robyn finds the transition challenging for a number of reasons. Those with experience of dementia and ageing parents will nod their heads at many of the issues she tackles and remember. Everyone’s journey of this nature will be different however there are likely to be commonalities. I found myself liking Robyn enormously. The matter of fact, colloquial narrative conceals the pain mostly if not always successfully. I was happy to be allowed to be part of her (& her family’s) life for this important though rather brief time. In the end maybe I can put it like this – I’d be very happy and proud if Robyn had been my daughter.